The business press regularly provides readers with articles espousing the virtues of active vs passive investing. And, with the proliferation of exchange traded funds (ETF), retail ‘investors’ are gradually succumbing to the constant bombardment of product advertising and embracing the concept of lower cost, passive investment options. Behind this behaviour change, is the gradual realization that successful investing requires, at least to some degree, a level of INVOLVEMENT. In other words, buy & hold does not necessarily mean ‘buy & die’. There are countless examples of individuals and investment firms that have outperformed the market indexes by actively investing the TIME and INTEREST required to achieve success.. Don’t believe me? Then read this well-crafted obituary for the legendary active fund manager, Peter Cundill. In other words, successful active investors perform two critical actions that lead to the growth of their wealth: one, they take the TIME to analyze their investments with a goal to find a qualified target entry level. Two, they wait patiently until the market provides a buying opportunity and then continue to monitor the investment after purchase. 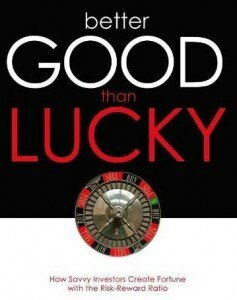 In a nutshell, they create their own luck…the clear message from Charles Rotblut’s new book, Better Good Than Lucky . Rotblut, a chartered financial analyst, aims to provide the lay-investor with a succinct, easy-to-read reference tool that attempts to provide a process for evaluating investments in the fewest number of pages. Is it a ground breaking book, covering uncharted territory? Not at all. However, the author knows that many existing investment texts are simply intimidating to the novice investor due to their content, complexity and length. His aim is to provide an analysis process in less than 200 pages, with his Risk-Reward Scorecard (RRS) serving as a culmination of all the lessons. Quite simply, with RRS the goal is to measure the likelihood of a change in price in either direction. True investing provides room for error. The book is clearly aimed at the retail investor who has limited time and knowledge but wants to become INVOLVED with the investing process. Yes, Rotblut does hold a spot for the use of ETF’s and the benefits of some passive investments. But his focus is clearly on individual equities as part of a diversified portfolio. Like the investment gurus of past and present (ie: Graham, Buffett), the author chooses to ignore the ever-present market noise (which gets louder by the day) and focus specifically on the valuation of a company. And, as we are told time and time again, he also reminds us NOT to become involved with any business we do not understand (recall that Warren Buffett sat out the dot-com bubble because he couldn’t understand the companies…not to mention the behaviour of the herds). Like many other authors, Rotblut emphasizes that every purchase eventually leads to a sale. And part of his message, is to identify a target selling price along with the conditions leading to a sale. In other words, successful investors have a PLAN ! And that plan is driven by what he calls an investment philosophy. In the section covering Portfolio Theory & Management, the author devotes an entire page to one of my favourite topics: the ownership of your company’s stock. I am simply amazed at the number of people who own boatloads of company stock, stock options and restricted stock units, with no idea of how much the holdings make up of their total portfolio – not to mention that this is on top of their pay cheque. Sometimes, loyalty can lead to irrational behaviour and high risk. A stock is a stock is a stock. Rotblut’s message: make sure your wealth and your salary are not dependent on the same industry, wherever possible. One step that can serve to support your investment philosophy and minimize emotional responses, is the utilization of an Investing Journal. The author points out that with a structured approach (ie: a checklist of factors for purchase), more discipline is applied to a previously random, incoherent and unorganized process. Following his recommended approach, the investor is forced to explain (in writing) why a stock has been purchased, what factors will lead to the potential sale and what your expectations are for the investment. On top of that, I would add that there should be a section devoted to lessons learned: did the holding perform as expected ? What learning can you apply to future analysis and investment ? Note: Peter Cundill maintained a daily journal. Rotblut explains that there are many signals and tools that can indicate it is selling time: price and volume movements, technical analysis, stop-loss orders, news events (Shoppers Drug Mart comes to mind as a recent example), as well as downward movements in earnings estimates by market analysts. Recall my comments as they relate to buy and hold. Several pages are devoted to the analysis of company business models and financial statements. Included are details on the components of the primary financial statements, the associated trends to watch for, specific financial rations (P/B, P/E) and how analysts use discounted cash flow (DCF) to create price targets. It is too bad that the target length of the book prevented the author from providing a more comprehensive analysis of an actual 10K report, as most retail investors would find this to be daunting task on their own. Perhaps for a future addendum ! Sadly, too many investors cannot get beyond the glossy pictures in the annual report and dig into the dry, unexciting world of data and footnotes where the truth lies (was that Freudian ?). That suits Warren Buffett just fine! The final chapter serves as a nice review of the chapter concepts and concludes with a presentation of the Risk-Reward model Scorecard. Rotblud emphasizes that the RRS (as well as technical analysis) is only a component of the total analysis process – a part of one big homework assignment when choosing future investments. But the value comes from the discipline. The value comes from the effort. And the value comes from your INVOLVEMENT. If you want to improve your success rate, remove the emotional responses, and enjoy the improved odds of meeting your financial goals, then Better Good Than Lucky can serve as a valuable tool in introducing discipline to the active investing process. Otherwise, buy a mutual fund and hope that Lady Luck is on your side. I like the return to the analyzing the fundamentals of a company that this book provides. Too many people these days are trying to follow stock charts and find patterns, rather than just plain and simple looking at a company’s balance sheet.